Chalk your hands, grasp the bar, and experience the ultimate rush of soaring through the air during a 1.5-hour trapeze lesson. Located just minutes from the Las Vegas Strip, you'll follow the instruction of a professional coach who will ensure you have the time of your life. Practice basic moves, such as hanging by your knees, and even try a release and catch at the end of your session. Ready for the ultimate Vegas adventure? 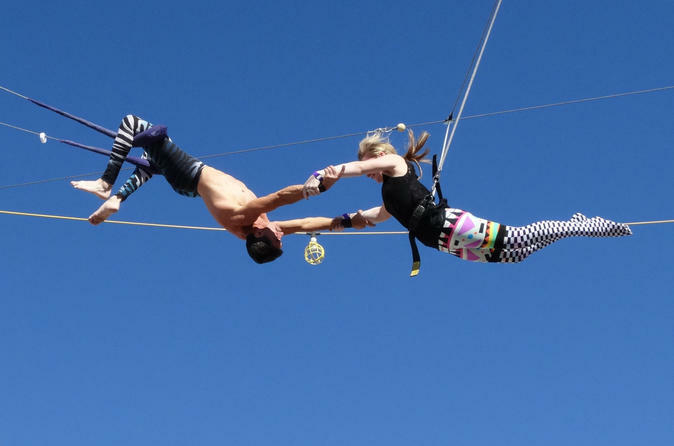 It’s time to try your hands at the high-flying trapeze. Dress in comfortable, athletic-style clothing for easy movement and head over to Trapeze Las Vegas, approximately 15 minutes from the Vegas Strip. Here, you’ll meet your professional instructor for a 90-minute lesson. Your class begins with a basic trick called the 'knee hang.’ After learning the technique on the low trapeze bar, each person will get three to four turns to practice it on the high trapeze. A catch net protects you from injury. By the end of the session, you’ll get to perform the knee hang and this time be caught mid-air.